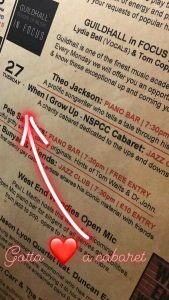 When I Grow Up is a one night cabaret put on at Toulouse Lautrec in order to raise money for the NSPCC. It focused on songs from the musicals which revolved around childhood, sibling relationships, dating, parenthood and more. Organised and put together by Kate Vlietstra the song choices were unusual and interesting. The show tended to avoid the overdone musical theatre songs and instead go for more unusual choices such as ‘Times Like This’ from Lucky Stiff, ‘Everything Changes’ from Waitress and ‘Fight The Dragon’ from Big Fish. I like to think that I have a good knowledge of musical theatre songs but there was a good few in there that I had not heard before and I enjoyed discovering. My only suggestion would be that if going for more unusual songs, a set list on the tables (or even sold for 50p to help raise more money) would have helped and quelled my curiosity!! There were 9 vocalists on the night all ably accompanied by Refiye Mehmet on keys. The vocalists were all very different stylistically which again kept the interest peaked. I was particularly impressed with Abbie Minnock, she had a lovely soprano voice along with good comedy timing. It was a shame that Abbie didn’t have a solo to really show off what she can do vocally. Michael Stacey also had a strong voice and his interpretation of ‘You and Me (But Mostly Me) from Book of Mormon was a highlight of the night. Some of the singers may not have been as strong vocally as Abbie and Michael but all of them had bundles of personality and ensured that you were entertained throughout. The dialogue in between was nicely delivered, with thought put into how to link the numbers and often make them personal to each vocalist. Dan’s story about his father had the whole audience chuckling away. Overall it was an enjoyable night for a worthy cause and thanks to Kate for not only inviting me but helping me discover new musical theatre songs. If you liked this review you might also like my review of Top Hat by Cygnet Players, Dogfight by SEDOS and A Chorus Line by GEOIDs.